On a flight I took to Los Angeles from Seoul, I had hours on hours to watch movies. However, the in-flight entertainment did not have a very satisfying list of Korean movies (I had already seen and reviewed majority of the films). However, there was one that I did not watch yet, but quite frankly didn’t really have much desire to see. That movie being <Champion>. Nevertheless, due to their being a lack of intriguing Kfilms, and the fact that Don Lee was starring in it, I decided to give it a go. <Champion> had its theatrical release on May 1st of 2018. Directed by Kim Youngwan, who’s previous works I had not seen before, <Champion> features the beast Don Lee, Kwon Yool, and Han Ye-Ri. 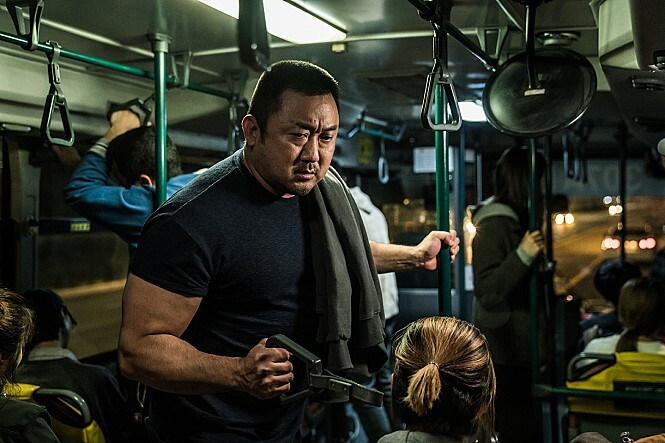 Without a doubt 2018 was the year of Don Lee, aka Ma Dong-Seok, starring in 4 other Korean movies: <Along with the Gods: The Last 49 Days>, <The Soul Mate>, <The Villagers>, and <Unstoppable>. I must say, one may not like all of what he’s in, but you need to acknowledge his hustle. As with practically every other movie he’s in, Don Lee plays a macho-man that can destroy everything that’s anything in his way, but is a teddy bear on the inside. Yes, he’s basically the same character in all of his productions, and yes it can get a little tiring, but I’m not complaining. Love his works. Mark (Don Lee) dreamed of being a world champion arm wrestler. However, he’s now working at an LA club as a bouncer. His friend Jin-Gi (Kwon Yool), who claims himself to be the best sports agent, convinces him to move to Korea. But little does Mark know that Jin-Gi was scheming to make quick cash by having Mark compete in arm wrestling matches. Upon arriving in Korea, Jin-Gi presents Mark with his birth mother’s home address. Contemplating whether he should visit his mother or not at first, he eventually decides to go. However, instead of finding his mother, he finds his sister that he’s never met before, Su-Jin (Han Ye-Ri), and her two kids. After living his life alone for decades, he suddenly finds a new family in Korea, and now has definite reason to pursue his “World Champion” goal once again. One thing that I always complain about when English is used in Korean movies is that it’s extremely awkward. And another factor I criticize frequently is that the acting by actual English speakers is also bad. It’s like a zero-sum game, where you have to have one or the other and can’t have both. Not saying that all of the English in <Champion> is good (it isn’t, but I’ll get to that later), but Don Lee’s English was very impressive. I mean, I guess in a way I shouldn’t be surprised, as he’s technically an American (he’s a citizen of the US; hence, the English name Don Lee). But I was very surprised by how natural his spoken English was. Plus, his acting was on point as well! I can’t say that the movie itself had both great English speaking and acting, but on a micro level, we were given satisfaction of both elements with Don Lee’s performance. Apart from Don Lee, the acting by the other actors were good as well. Han Ye-Ri, who played the female lead, was marvelous. Also, the child actor/actress that played the nephew/niece of Don Lee (Choi Seung-Hoon and Ok Ye-Rin, respectively) were absolutely adorable. I especially loved Ok Ye-Rin, she was cuteness to the max. There were frequent light humors that had be chuckling. I can’t lie, there were some cheesiness to it. A few scenes had me cringing my fingers, but overall it was a light, entertaining film that kept me amused through its duration. As foreshadowed in the previous section, the English acting by the actors other than Don Lee were horrible. This goes for both Korean actors speaking English, and English speakers not being able to act. We face a problem of a zero-sum game where we can’t have both good acting and English speaking in Korean cinema. Albeit, Don Lee was good, he’s the major, major minority. Kwon Yool, who played Mark’s friend Jin-Gi, had very awkward English; and the several “Americans” couldn’t act to save their lives. The overall premise of the movie is kind of odd. It’s a whole feature film dedicated to arm wrestling, which isn’t seen as a major sport in either Korea, America, or anywhere I know of. Moreover, the story itself was pretty generic and predictable. Mark partakes in an arm wrestling tournament; care to guess how it ends? You’re probably correct. And lastly, the movie tries to be heartwarming and touching. Yes, it does get emotional, but there were undoubtedly some cheesy moments. Like every Don Lee movie, <Champion> was a decent light watch. You wouldn’t want to watch this for some deep, meaningful experience. However, you will get some level of good comedy, drama, and emotions with it. If you love Don Lee and the other works he’s been in, I’d recommend a watch.